*Data taken from official Alpha Epsilon Delta honor cord provider website on 3/12/2013. Graduation represents one of the most important achievements in a students life. For some students, however, earning their undergraduate degree is just the first step in a long journey towards a professional career. Those students who are interested in entering the medical field after they have finished with their traditional education deserve to be honored for their past excellence and their future potential by being offered red cords and lavender colored honor cords to wear at their graduation ceremonies. Red and purple (lavender) honor cords are used by Alpha Epsilon Delta, also known as the health pre-professional honor society. 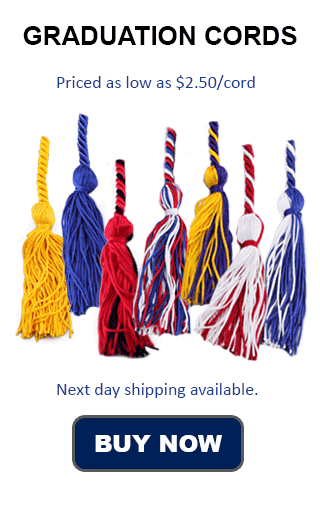 Cords available through the Alpha Epsilon Delta website are comprable to our cords in quality and price, but Honors Graduation offers a flat $4.00 shipping fee, as well as having options for bulk pricing, so your students can get their honor cords from us quickly and for less. Your health pre-professionals deserve recognition for their academic excellence and diligence at your commencement exercises, and the red and lavender honor cords offered by Honors Graduation for honor society students are the perfect way to show them your admiration and respect. Be sure to check with your school administrators for more information and details about how the honor cord should be worn. Your graduate has worked so hard to earn their degree. Show them how proud you are of their success by offering them honor cords to wear at graduation.